In 2017 we installed a CONTINUOUS PRESSURE-FLOW® COOKER operating system in our laboratory. It includes: A Feed Conveyor, Soak Tanks, Dewatering Belt, Pump Line, a Screen, a 30″ Pressure Cooker and a Vibrating Dewatering unit (not shown). Dry Beans are pre-soaked for 2 to 4 hours and fed into the Pressure Cooker where they are fully cooked in 6 to 8 minutes. The result is IQF Quality product and retorting is not necessary. 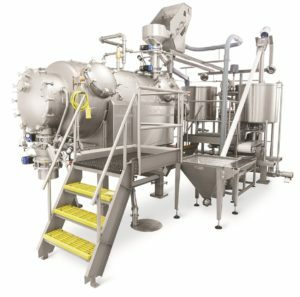 A major processing step eliminated for dry beans. Rice is cooked to perfection in 5 to 8 minutes, is pure white, has the right texture, and holds more starch which increases recovery. Every customer who has seen the process has been impressed. CONTACT US to run your products in our laboratory and see the dramatic results for yourself.